Love him or hate him, Alf was an icon of 1980s TV. The wise-cracking alien was a merchandising magnet, appearing on everything from lunchboxes to comic books to talking stuffed animals. Of course, there were cards as well. 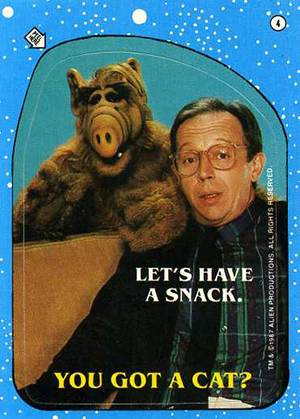 1987 Topps Alf trading cards capture the corny jokes of the show as well as some self-referential hobby humor. 1987 Topps Alf cards are spread over two series. The second came out in 1988. Series 1 includes 47 base cards, 22 Bouillabaseball inserts and 18 stickers. Series 2 is a little bit smaller with 44 base cards, 22 Bouillabaseball cards and 11 stickers. Base cards have shots from the show. They have a mix of humorous captions or short bits of dialogue. One-liners and puns are at nearly every corner with cats getting a lot of the punchlines. It definitely stays true to the show. As one would expect, the sarcastic alien is the focus of most cards, although the Tanner family has a few of their own. Besides the numbering, Series 1 and Series 2 cards are easy to tell apart. Those from the first set have yellow borders. Series 2 cards are red. Bouillabaseball inserts expand the Alf universe and take things back to his home planet of Melmac. The cards spoof traditional baseball cards. 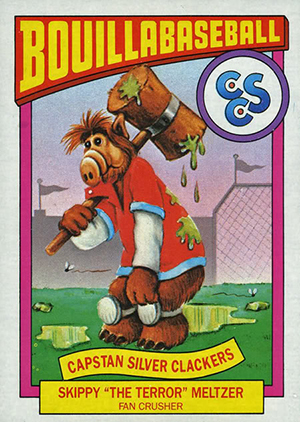 1987 Topps Alf stickers are typical of the era. They have a die-cut image and backs can be used to create a puzzle. Series 1 Stickers have a blue starry border. Series 2 keeps the star motif but opts for black borders. This isn't the only collection of Alf cards. 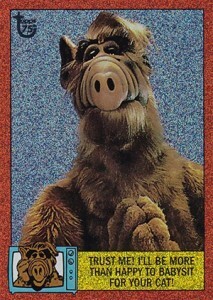 In 1987 a set of sticker cards called U.S. of Alf was released. 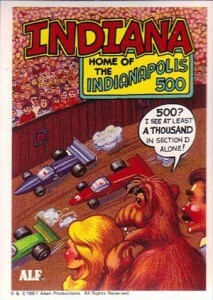 Each card focuses on a different state along with an Alf-centric illustration. 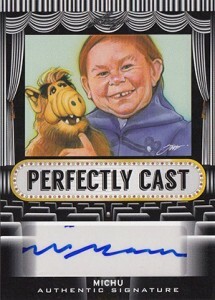 Michu Meszaros, the man inside the Alf costume, has autographs in 2013 Leaf Pop Century. 2013 Topps 75th Anniversary has an Alf card in the main set as well as a couple of parallels. 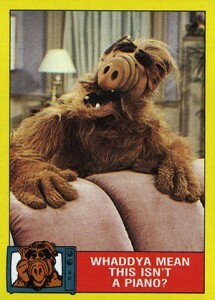 1987 Topps Alf Series Stickers #1 How about a hug for the old Alfer? Alf: His Life and Times #40, Whaddya Mean You're Trying to Get Cable? Alf: His Life and Times #31, Get My Lawyer! Nobody Calls Me a Litterbug! 2 Whaddya Mean This Isn’t a Piano? 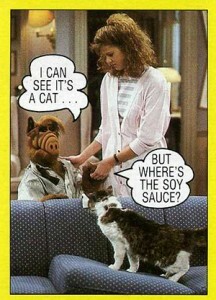 3 I Can See It’s a Cat…But Where’s the Soy Sauce? 4 I Think I’ll Order the Cat of the Day. 5 I Use It for Scanning Hi-Frequency Interplanetary Modulations…and Watching Dr. Ruth. 6 Hey, How Come My Bowtie Doesn’t Spin? 7 I Think I’ll Take a Little Catting Practice. 8 What Do You Mean, “Willie Is the Fairest One of All”? 9 Hey, I’m Supposed to Be the One With the Silly Hair. 10 Hi, Honey, I’m Home. 11 You’re Right! TV Is a Lot Better When It’s Plugged In!! 12 Smile When You Call Me Repulsive! 14 Don’t Look Now, But There’s an Alien Behind the Couch. 15 Don’t Come in Yet. The Kitten Needs a Second Coat of Spaghetti Sauce. 16 Cheer Up. We’ll Stop Falling Off the Couch Eventually. 17 Wash the Laundry? I Thought You Said Toss the Laundry. 18 Would You Buy a Used Car from This Family? 19 Are We Having Fun Yet? 20 Alf, You Can’t Dry Dishes by Putting Them in the Toaster. 21 My Earth Family Doesn’t Understand Me, Doctor. 22 Tastes a Lot Like Calicoquille-St. Jacques. 23 I Told You. I Didn’t Eat Lucky. Do You See a Tail Down There? 24 TV Dinner? Isn’t the Picture Tube a Little Tough to Get Down? 25 Siamese on Rye, Stella. Tuck in the Tail. 26 Hi There. Do You Come Here Often? 27 Who Needs a Pot of Gold at the End of the Rainbow. I’ve Got a Refrigerator. 29 Operator, I’d Like to Place a Collect Call to the Man in the Moon. 30 I Wonder If I Can Deduct Flea Powder as a Business Expense? 31 Get My Lawyer! Nobody Calls Me a Litterbug! 32 C’Mon, Let’s Build Something Fun…Like a Blonde. 33 This Isn’t Your Shirt, Willie. I Borrowed It from a Neighbor’s Clothesline. 34 What a Shame. Nothing Left to Eat…Except That Pillow. 35 Who Ordered the Grilled Broccoli and Tuna-Flavored Soda? 36 I’m a Melmac Doodle Dandy! 38 So the Cat’s Missing. Why is Everybody Looking at Me? 39 Siamese & Mayo. Oh! I Thought You Said Cinco De Mayo. 40 Whaddya Mean You’re Trying to Get Cable? There’s Tons of It Lyin’ Around! 41 I Wanted a New Car for My Birthday…But This Is Ridiculous! 42 I Don’t Mind If You Go Steady. Just Not With Each Other. 44 Hey, Did You Stop Using Hair Spray and Switch to Jell-o? 45 O.K. Who’s the Wise Guy Who Made Off with My Persian on Rye? 46 I Can’t See the Future, But I Am Getting a Rerun of “Diff’rent Strokes”. 49 It’s Tough Being a Living Legend! 50 You Know, Mummies Were the First Ones to Sing “Wrap” Music! 51 Whatsa Matter/ Cat Got Your Tongue? Har Har! 53 I Think I Left the Cat in the Dryer! 55 I Knew I Had Fans…But Not These Kinds of Fans! 56 It’s Important to Eat All Your Food…Otherwise I Will! 57 He’s Not Sick. He Just Needs to Chase the Cat for Awhile! 58 Brother, Can You Spare a Cat? 59 I Ate the Phone? Well, That Explains This Ringing Sensation in My Head! 60 I Was Too Small to Play Quarterback, So They Made Me a One-Eighth Back! Har Har! 61 No More Coffee for Me! I Had Too Much Yesterday…And I Thought We Were Having an Earthquake! 62 Wait! Dinner Isn’t Over! I Think I Smell Cat! 63 If We’re Gonna Play Hide-and-Seek, You Have to Cover Your Eyes! 65 Let’s Play Cards! Everything’s Wild for Guys from Melmac! 66 We’ll Throw Alf a Surprise Party! Better Yet, Let’s Just Throw Alf! 67 I Never Met a Cat I Didn’t Like…for Dinner! 68 Did You Get Shorter or Is Your Son Growing Very, Very Fast? 69 Did You Know I Wear a Size 44 Suit, Extra Squat? 70 Say, Don’t I Know You from Another Planet? 71 What Bowling Ball? I’m Not Letting My Cat Out of the Bag! 72 Trust Me! I’ll Be More Than Happy to Babysit for Your Cat! 73 I’ve Got a Pair of Aces and This Replica of My Birth Certificate! 74 I Only Dress Like This So I Can Carry a Briefcase. It’s Perfect for Big Lunches! 75 Are You Sure I Can’t Order a Fudge Ripple Sundae Here? 78 Hey, I Told You to Be Careful with Those Velcro Eyebrows! 79 What Can I Tell You? The Girl Who Sold Me This Shirt Was Very Cute! 80 The Winner! You Actually Finished Your Meal Before Alf Could Finish It for You! 81 Is This a Bowtie or Am I Being Choked by a Snake in Formal Wear? 82 Vote for Me! I’m for a Cat in Every Pot and Two Aliens in Every Garage! 83 Who Says You’re Not Supposed to Eat the Bag After You Dunk It? 84 Is There Such a Thing as Being Too Cool? 85 There’s No Worse Feeling Than When the Meal Is Over! 86 Watch Out, Spuds! The Real Party Animal Has Arrived! 87 If I Get Any Better Looking, We May Have to Sell Tickets! 88 What Happened? No More Ring Around the Collar? 89 I Was So Hungry, I Ate the First Chapters of This Book! 90 When You’re Like Me, Finding Hair in Your Food Is an Occupational Hazzard! 91 A Hair Dryer? I Thought It Was a Bagpipe That Went Berserk! 1 How About a Hug for the Old Alfer? 2 I’m Only 229. I Haven’t Hit My Prime. 3 You’re Out of This World! 4 Let’s Have a Snack. You Got a Cat? 7 Have a Seat…Let’s Have a Chili Cat! 8 Willie’s Okay…for Someone Without Fur. 9 I’m a People Alien! 10 A Whisker for Your Thoughts. 14 Don’t Be Repulsed…It’s a Turkey! 17 What Can I Say? The Kid Adores Me! I just found around 40 random bouilla cards and a mix of just your regular Alf cards, I just want to rid of them. How much would someone pay for the full lot? ?